Hannah Genders shows us around her award-winning “journey garden” at the Malvern Spring Show. I’ve just arrived back home from taking down my show garden at RHS Malvern Spring Show. It took nearly a month to put it all together and it only takes a day to take it apart, which I have to say is quite sad as you do get attached to it. 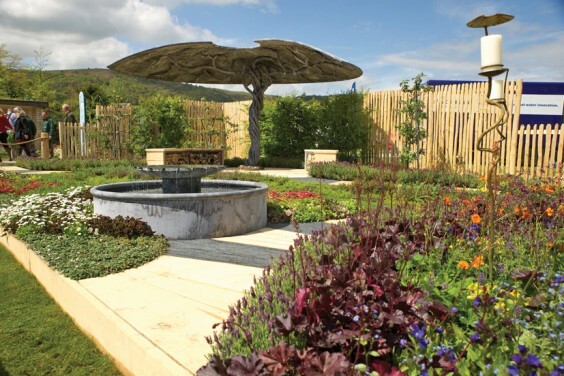 The great news about this garden, though, is that it has a life beyond the Malvern Show – it will be rebuilt this summer at St Michael’s Hospice in Hereford for all the patients, staff and visitors to enjoy. The last four days of the show went really well with so much interest in the garden and we gave out around 4,000 leaflets. Gardeners’ World gave us a very good slot on their programme which made the interest in the garden even greater. This is the first time I’ve worked with the sculptor Matt Sanderson, who made the wonderful angel tree as the central feature and all the other metal parts of the garden. There was a real synergy in our work together and we hope to do more in the future, although as I said on Gardeners’ World, this will be my last show garden. It has been another wonderful experience, and very moving to talk to people who are touched by the story of our journey garden and recognise how we all need to be connected with nature, beauty and gardens when we go through hard times. The planting came together well; the tapestry, no-grass lawn at the front of the garden proved a big hit with visitors and they loved the idea of lots of flowers that you could mow off twice a year, so cutting down on the work but also getting bees and butterflies back into our garden spaces. The water feature was just as I wanted it to be, simple but stunning and very calming. The carpet tiles in the path, which had been recycled from the old hospice, looked really good, almost like slate which had been slotted in end-on, and the benches under the tree had lots of texture with all the materials packed into them. I think the pictures speak for themselves, so all I need to say now is a massive thank you to all the people who helped make this special garden possible. By the way, we won a silver gilt medal! Hannah’s interview on Gardeners’ World is available on the BBC iPlayer – search for episode 9 which was originally broadcast on May 8.